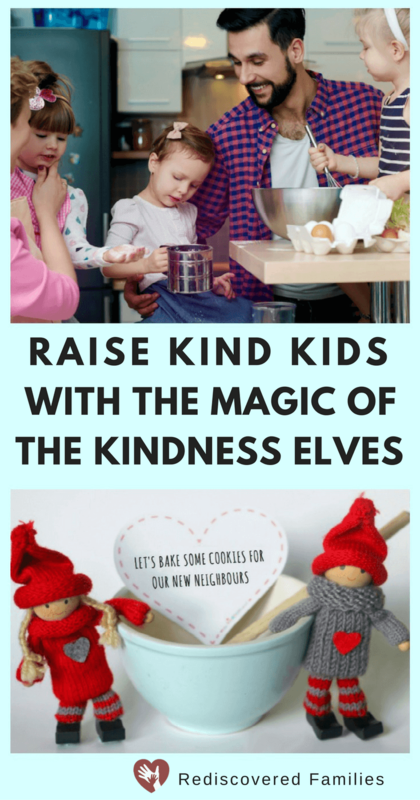 Start a new family tradition this holiday season with the magic of the Kindness Elves. This alternative to the Elf on a Shelf is a great way to inspire your children to start looking out for others! Make caring a a natural part of your Advent and Christmas traditions and you will find yourself raising kind kids! This Posts contains affiliate links. This means we earn a commission from sales made via product links in this post. For more information click here. I LOVE the holidays. It is a big bright spot in the midst of the long dark winter nights. We all need celebrations and this one has it all. Cheesy music, decorations, and dark chocolates. What’s not to love? But I have to confess there comes a point every December when I find myself feeling a little grumpy. It isn’t the crowded stores, overfilled schedule, or even racing other drivers to the one remaining space in the parking lot that brings out my inner Grinch. It’s the consumerism, the blaring commercials, and the overwhelming gimme excess that does me in. So when I heard of a wonderful new tradition that was helping families focus on giving rather than getting I had to take a closer look. I was hooked right from the moment I saw these pictures. I mean how cute are these things? But wait there is more! 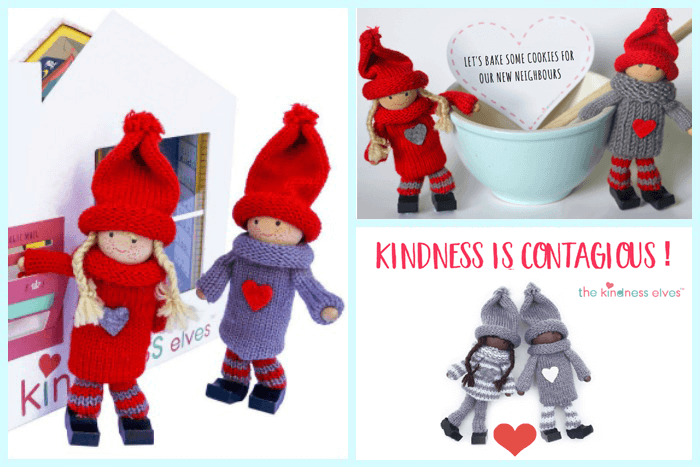 Kindness Elves are magical friends who love to sprinkle kindness and joy where ever they go. 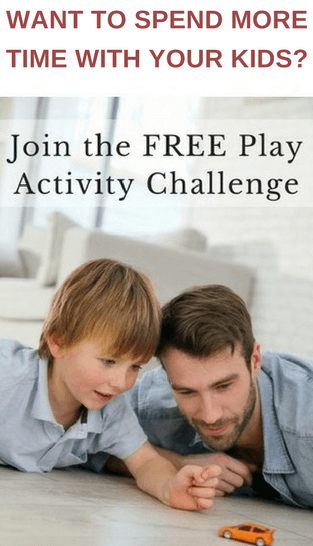 They’ll come into your home and encourage your children to do small acts of kindness in their daily lives. What? Cute magical friends that get kids excited about kindness. YES! This is gold! 1. At some point in December (you set a date to help keep things manageable at this crazy busy time of year!) the Kindness elves arrive at your home with a little letter of introduction. The note explains that they are on a mission to see children’s kind and loving hearts in action! They clarify that they will be putting out kindness suggestions each day. Bake some treats and take them to the fire station for the fire crew. Make a Christmas card to give to someone who lost a loved one this year. 3. Your children follow the instruction and get that feel good experience of being kind. Optional extra: If you want to reinforce the kindness lesson The Kindness Elves can leave the children a little postcard or a little note for them to find in the morning. I loved it when I saw you reading your new book with your little sister. You were so kind to help your Mommy fold the laundry! 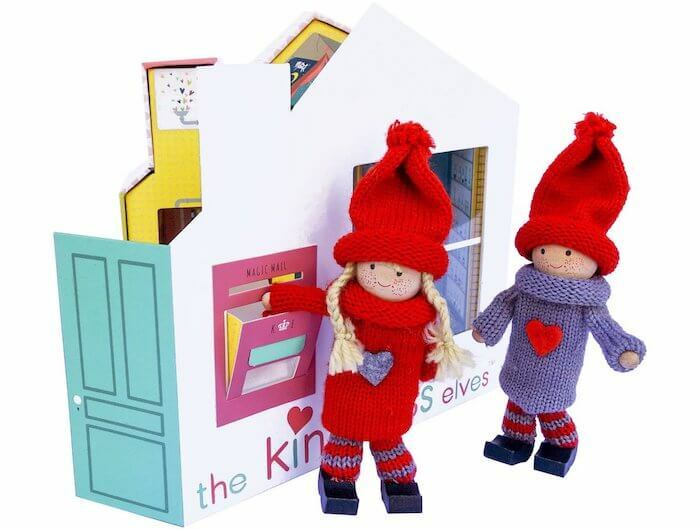 All you have to do each night is place the elves somewhere in your home with the kindness note. You can choose acts of kindness and tailor them to your kids ages and stages. You can also set up the tasks to coincide with your schedule. Use simple actions for busy days and more involved ones for quieter days. There are loads of ideas that are super simple and most require no money to achieve. Looking for some ideas? Here’s 25 of them just ready to go. The other thing I like is that you can also mesh your acts of kindness with holiday traditions and everyday activities. Do you usually bake holiday cookies with your kids? Make some to give away! When you go grocery shopping ask your kids to choose a few items for the food bank. DO you buy a special holiday plant? 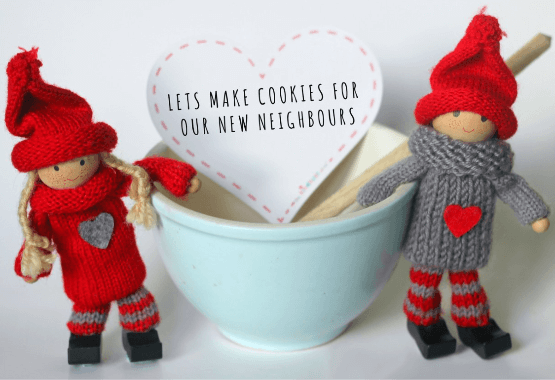 Have your kids choose an extra one to give to a lonely neighbour. Do you usually make cards with your children? Make a few extra to give away to those who could use cheering up. That’s it! You don’t have to spend hours finding ideas or setting things up. 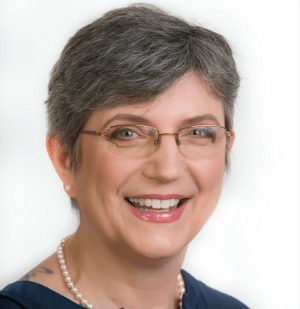 Are you working to raise kind children? Of course you are! I think we all want to raise kind children. We want our kids to grow into adults who think about others and notice when people need to be helped in some way. And according to Richard Weissbourd, a Harvard psychologist with the graduate school of education, those are very effective ways to raise kind kids. 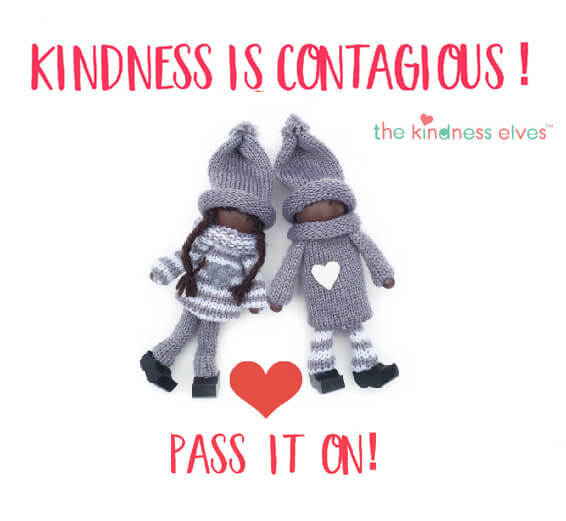 Aristotle pointed out that, “We are what we repeatedly do.” So it follows that if we want to raise kind kids we need to give them loads of opportunities to be kind. 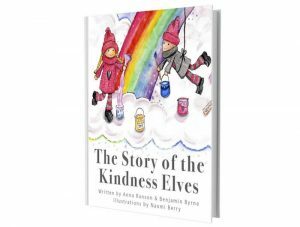 The magic of Kindness Elves is a super easy way of doing that. And it makes for a wonderful perfect Christmas activity! Want to bake cookies, but need to keep it super easy? Try these no bake simple recipes. Need some more ideas for Christmas Acts of Kindness? Find some here.